Product designers are experts with a very diverse toolkit. 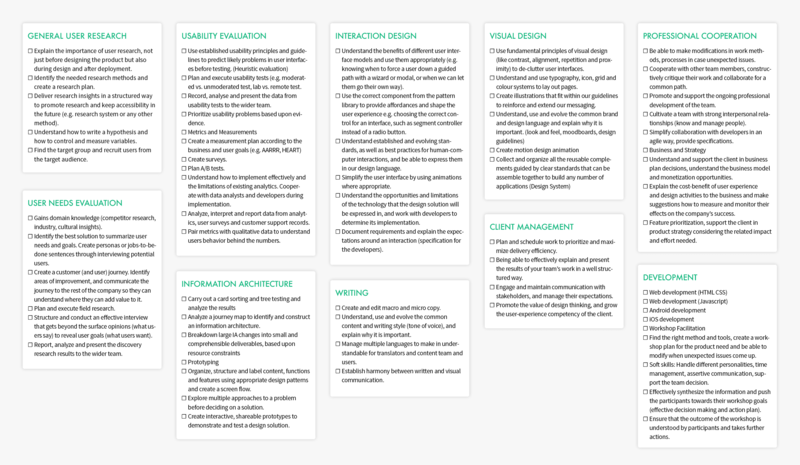 Competency maps help assess a designer or researcher’s unique combination of capabilities, to find out where they are and where they are going. Good team competency management is key for high-quality work, so, we recently mapped the whole team. In this article, we present a step-by-step guide on how to do it yourself. We at UX studio love learning. Each member of our team eagerly improves their own skill-set all the time. As a company, we aim to make sure everyone gets to develop themselves in the areas most important for them. In an effort to improve competency management in our team, we wanted to create a personal competency map for every person at the company. Two examples of competency maps. The competency map shows where each person stands in terms of each skill, showing which areas they should focus on. It will also help later when they want to track their progress in developing those skills. The maps serve goals not only on a personal but also a team level for team leaders because they can get a better overview of the team skill-set as a whole. 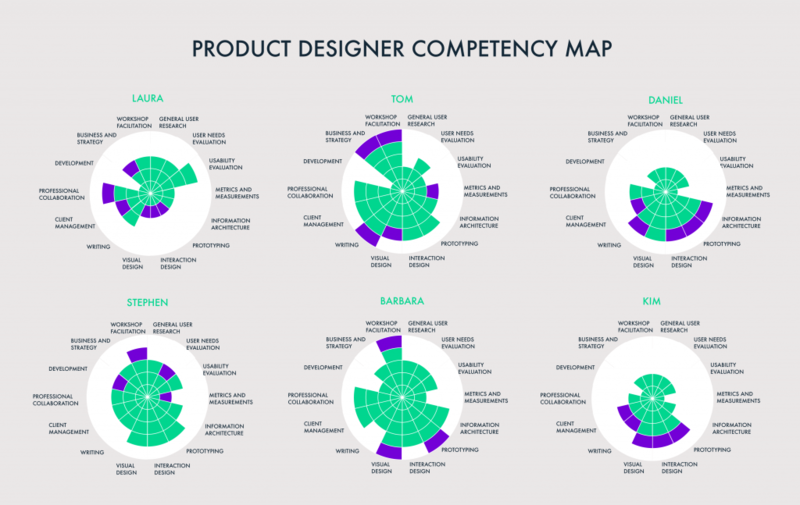 Competency maps can benefit any team, product or otherwise. Follow the five steps described below and learn to design your own competency map in no time. Step 1: Set up a list of key competencies. Just to make it clear: product designers have come to no universal agreement on their key competencies. Besides, the competencies change constantly, and so should your competency management. Find tools and adapt them to your needs. We did exactly that here at UX studio. Ultimate lists and expert articles about the basic UX and product design competences fill the internet. Dr. David Travis wrote a great article about the competencies of user experience that we liked. Also, the product team at Vend seemed to have used a similar method for their mapping activities. So, based on these two approaches, we created our own tool and are sharing our experience here. Naturally, teams all come in different forms. The above competencies include those we find most useful for our work. In teams of other types or domains, the list and hence competency management itself will likely look completely different. So, don’t hesitate to rewrite all this. This aims to give a holistic understanding of what your team members must know. What do those competencies mean in practice? We identified skills and actions showing someone has it or not. If you want to copy/paste this list, you can find it here. Step 3. Set up different levels of knowledge. Now we have finished with some basic goal-setting toward improved competency management, we now need a scale. This serves to measure each individual’s knowledge level in these areas. It will also set a good framework for discussion to help people identify their strengths and weaknesses. Return to it and assess the progress over time. 0 – Completely unfamiliar: Doesn’t understand the competency. 1 – Novice: Understands the competency and its importance. 2 – Advanced Beginner: Demonstrates this competency under supervision or with encouragement. 3 – Competent: Demonstrates this competency independent of supervision or encouragement. 4 – Proficient: Encourages or supervises others in this competency. 5 – Expert: Develops new ways of applying this competence measured on the world stage. You can see the empty competency map here. For our team, I created this and the colorful maps in Sketch. In case you don’t use software like Sketch or Figma, or you aren’t that confident in your design skills, I suggest you start with a simple spider web / radar chart using Excel or simple online tools like Vizzlo. Our empty competency map – now it’s time to make one for everybody! Have you read our e-book Product Manager’s Guide to UX Design! Download it for free now! Congrats! You’ve finished designing your competency mapping tool! This marks major progress for improving competency management. Now try it out, use it and change it if needed. Here, I share our experience and method for applying it. Feel free to find your own way. We created a Google form with the list of competencies and levels. We discussed the results, similarities, and differences during one-on-one meetings with the studio leader. We added the final conclusions to the map. Discussed three to five possible competencies they want to improve in the following months. Map of a senior user researcher who would like to focus more on Metrics and Measurement, Prototyping, Interaction and Visual Design and Workshop Facilitation. Now every team member has their map, which skill development should you focus on first? How can you determine the most crucial areas of expertise for your team to have right now? According to the Lean Analytics book, we can define five stages (empathy, stickiness, virality, revenue and scale stages) for a product lifecycle. As you go through on those stages, you’ll need different competencies. Therefore, it might make sense for a team leader to change the team, or improve your team members’ competencies accordingly. This stage identifies the real problem and real solution. It also addresses the question: Will anyone care? At this stage, you basically need “user needs and evaluation” competency, someone to learn the domain knowledge, do competitor research, field research and interview the potential users. They must also easily summarize and transfer the learnings to the team with personas, jobs-to-be-done sentences or customer journeys. Get the maximum amount of validated learning about customers with the least amount of effort. In other words, experiment with an MVP and quickly validate, or most likely invalidate your assumption. You definitely need a proficient level of information architecture, prototyping, and interaction design competencies to create prototypes, visual design and development skills to make it an MVP, and usability evaluation to learn from the feedback. This simply involves starting user acquisition and growing the user base. “Metrics and measurements” forms one of the basic skills at this stage, so learn what to do, measure, and make conclusions. Also, bring all the other skills from the stickiness stage. Starting to charge people and scale the product basically requires all your team’s competencies, especially the “Business and Strategy” for product feature prioritization. Don’t hesitate to read our article about prioritization techniques to learn more. 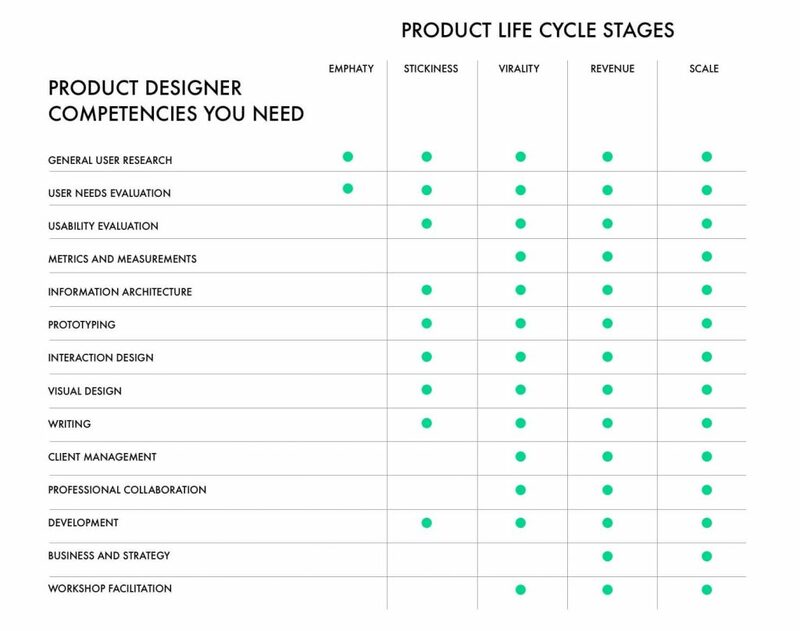 You need different competencies as you go through on the product lifecycle stages. Your personal to-do list: How to get started with competency management? Choose possibly necessary competencies and hire accordingly. Improve your team members’ competences by considering the next stage of your product’s lifecycle. Copy this form and ask each team member to complete it for themselves and two others they work with. Discuss the results one-on-one to objectively identify areas where the rating differs, and where they want to improve. Visualize the competencies in a map for everyone individually. Find patterns for the whole team and organize learning possibilities for them. This might take the form of a course they participate in as a team, or proficients who can teach the beginners. You might need another person to cover some of the needed competences for your team. Use the competency descriptions listed above for writing job postings. Use the competency areas to search for designer portfolios. Use the tool as a benchmark to define the needed competencies. Map out your own and define areas for improvement; visualize it. Want to learn more about our design process? Download our free e-book now! Or, would you like to learn all about our method and principles? Our CEO David Pasztor is the author of the Product Design Book. Order it today – with free shipping!